With three ecosystems, hundreds of unique desert plant species, several of fault lines, and magnificent geologic formations, Joshua Tree National Park is a truly fascinating place to visit that is worth as much time as you can give to it. And the park is incredibly accessible; nearly all of the campsites in the park's 11 designated camping areas are first-come, first-served, and backcountry permits are free and self issued unless you plan on rock climbing with bolts. 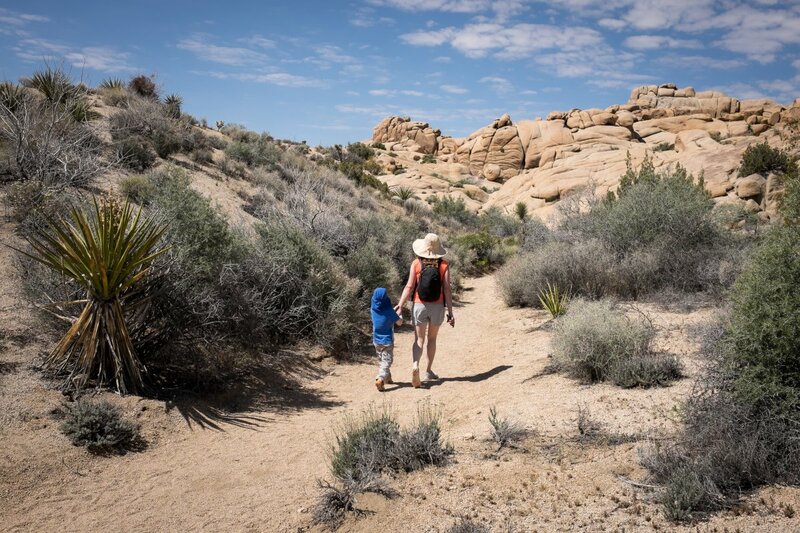 Indeed, most of this park is backcountry; if you have the fitness and commitment to make extended trips into this arid environment, you'll see a side of Joshua Tree that many are unable to enjoy. The majority of the park's attractions lie along Park Boulevard and Pinto Basin Road and are easily accessible by car. Viewpoints, historic and natural points of interests, and a plethora of day hikes make this park a rich and varied destination for everyone. Here are a few ideas for a long weekend visit to Joshua Tree National Park. 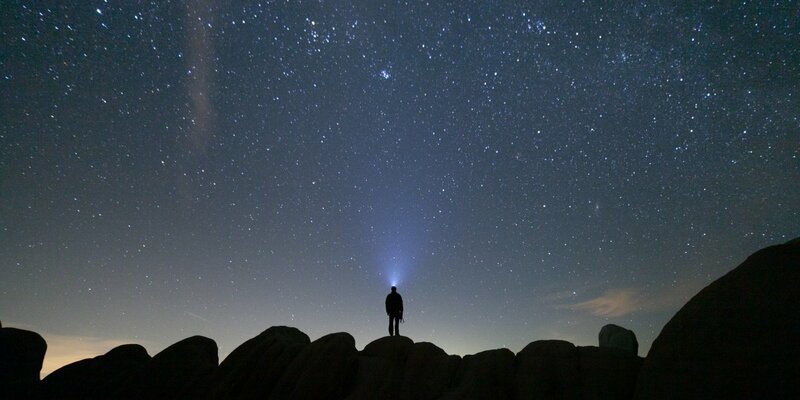 Enjoying some clear views of the stars from Joshua Tree National Park. Photo by Race Jones. Of the four entrances to Joshua Tree National Park, entering via the West Entrance carries with it the significant advantage of taking you by the park's largest visitor center, located outside the park in the town of Joshua Tree. You'll find heaps of resources for planning your trip here in addition to any updates and alerts regarding trail conditions. Park rangers are incredibly helpful in helping you plan and prepare an itinerary based on your interests and time constraints. Once you get oriented at the visitor center, consider stringing together several short adventures that will give you a sense of the land, scope, and history of the park. Keys View: One of the best views of the Coachella Valley, this viewpoint makes a perfect introduction to some of the larger geologic issues that helped make the park such a unique place. Lost Horse Mine: On your way back from Keys View, stop off here to learn about one of the very few productive mines in Joshua Tree National Park. Keys Ranch: William and Frances Keys were perhaps the most successful homesteaders in this area, and their old ranch, a National Historic Register Site, is available for tours. Hidden Valley Campground: If you're camping in the park, take a look around Hidden Valley Campground and find a spot, hopefully with a little shade from the towering rock formations! Hidden Valley Nature Trail: Short and sweet, this hike leads through a narrow corridor that William Keys actually blasted open so that his cattle could access grazing land. Popular with rock climbers, this walk is a great way to cap off the day before heading back to camp. Of course, depending on the season, you may want to hit this hike early in the morning to avoid the heat. Ryan Mountain: Start off your day with a little altitude and enjoy another fine view of the park. This hike is short but steep, so be sure to bring plenty of water and wrap it up before lunch. Cap Rock Nature Trail: If you'd rather skip the climb but would still like some exercise, the Cap Rock Nature Trail leads through some beautiful terrain and still brings you back in a short amount of time. Skull Rock Nature Trail: Skull Rock is one of the more iconic spots in the park, and it is well worth a look. That said, hordes of tourists stop here every day. If you are just looking at the rock formation, consider checking it out a little early in the day before the buses show up. If you have the time for a longer walk, however, you won't regret the entire Skull Rock Nature Trail. Geology Road Tour: This is a great alternative if the Skull Rock Nature Trail isn't in the cards for you. In about 18 miles you'll tour through 16 stops that showcase some of the park's most fascinating geology. Jumbo Rocks Campground: This enormous campground is in the middle of some of the park's most interesting rock piles. Spend an afternoon climbing around before heading in to camp for the night. The Skull Rock Nature Trail is a great fit for families. Photo by Halvor Tweto. Cholla Cactus Garden: The Cholla Cactus is an impossibly prickly species, and its extraterrestrial appearance is only compounded when a number of plants are seen together. As you are driving from the west side of the park toward the east, stop off here for a quick walk among these strange cacti. Ocotillo Patch: The equally unusual ocotillo cactus is another of Joshua Tree National Park's quintessential plant species, and its presence tends to mark the transition from the Mojave toward the Colorado Desert. The ocotillo bloom is unpredictable, but keep your eyes open as you drive southeast from the Cholla Cactus garden. Lost Palms Oasis and Mastadon Peak: Because the stops for the cholla and ocotillo cacti were short, you should have plenty of time for this hike near the southeast entrance and the Cottonwood Visitor Center. The hike to Mastadon Peak is just 3 miles round trip, and if you extend the walk all the way to Lost Palms Oasis you'll total 7 miles for the day.